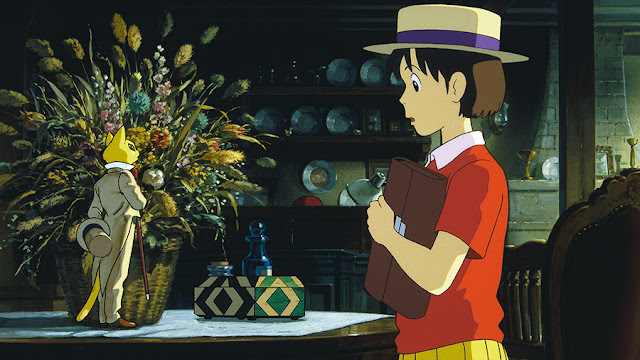 'In a roundabout way, this is Studio Ghibli's answer to Inside Out'. Looking at the UK Blu-ray cover art for Whisper Of The Heart, you'd be forgiven for thinking that director Yoshifumi Kondō had followed in the footsteps of Studio Ghibli co-founders Hayao Miyazaki and Isao Takahata in bringing a fantastical story to the screen for his directorial debut. In fact, what Kondō presents is far more grounded in reality, although you get the feeling that the somewhat misleading nature of the artwork - also used on the 1995 Japanese theatrical release poster - is at least partially intentional. To put it another way, Kondō litters his film with fantasy red herrings. Again and again, the director playfully leads the audience up the garden path, bringing Whisper Of The Heart to what feels like the brink of becoming a modern fairytale before allowing the narrative to continue on just as naturalistically as before. Main character Shizuku (Yōko Honna) is the driving force behind this approach. A fourteen-year-old schoolgirl growing up in Tokyo, Shizuku is obsessed with reading and spends much of the first half of the film looking for her own storybook adventure to begin. After following a cat who sat next to her on the train, Shizuku laments that "it felt just like the start of a story" when the animal seemingly gives her the slip. As it becomes ever clearer that Whisper Of The Heart is not going to transform into fantasy, the journey we see Shizuku take through the narrative becomes increasingly satisfying. In a roundabout way, this is Studio Ghibli's answer to Inside Out delivered twenty years earlier - just a few months before Pixar released their debut feature, in fact. Working from Miyazaki's dependably charming script, Kondō's focus is on that transitional period of uncertainty where you're no longer a child but not yet an adult. Shizuku's negotiation of this time in her life feels entirely genuine as she deals with the pressures of exams, relationships both familial and romantic, and working out what she wants her life to be about. The main problem within Kondō's film is one of balance. The opening hour at times feels a little aimless in terms of narrative, taking too long here and there to achieve less than it should. This coupled with a few instances of excessive sentimentality - particularly the final scene - means that Whisper Of The Heart isn't perfect. But it is still another expertly crafted offering from Studio Ghibli, made all the more precious by becoming Kondō's sole feature film. The director, who was expected to become Miyazaki and Takahata's successor, died in 1998 before he could direct another release for the studio. Had Kondō been able to fulfil this destiny, there's little doubt based on the evidence here that Studio Ghibli would have been left in very good hands.